for applying Probationary Officers, Banking Associates is http://www.jkbank.com. The last date apply online application form is 24-10-2018. Candidates will be shortlisted based on their performance in the interview. 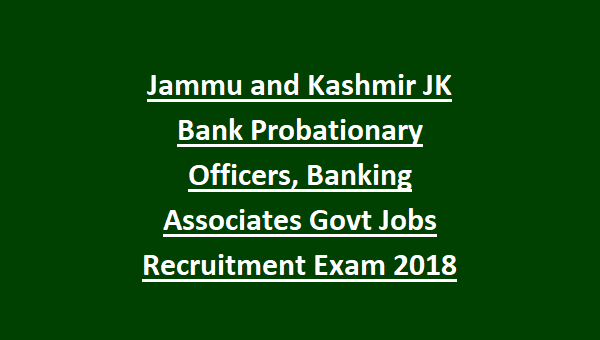 For the other details of age limit, educational qualification, salary, application fee and how to apply are given below for the Banking Associates Posts in J&K Bank Recruitment Notification 2018. The available vacancies in J&K Bank for Probationary Officers (PO) and Banking Associates Posts is 1450. As on 01-01-2018 the age limit for the candidates applying for the Probationary Officers (PO) is in between 18 – 30 years. And Banking Associates (BA) Posts the age limit is in between 18 – 32 years. 5 years upper age limit relaxation will be applicable for SC/ST category candidates. The educational qualification for Probationary Officers (PO) is candidates should have done Graduate/Post Graduate with minimum of 60% marks. For Banking Associates (BA) Jobs is candidates should have done Graduate/Post Graduate with minimum of 55% marks. The salary offered for the selected candidates is as per the Jammu and Kashmir Bank rules. The application fee for the SC/ST category candidates is Rs.250/-. Candidates will check in the Official notification for Exam pattern and syllabus. 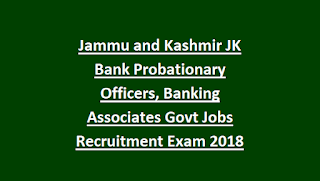 Interested candidates can apply for the Probationary Officers and Banking Associates posts in Jammu and Kashmir Bank through online mode only. The official website of J&K Bank for Probationary and Banking Associates jobs is http://www.jkbank.com. For more derails candidates can refer in the Official Notification. The online applications forms for Probationary Officers will available from 20-10-2018 to 06-11-2018. The online applications forms for Banking Associates will available from 24-10-2018 to 10-11-2018.